June Bug Muskie Spinner - get one in the water! I just completed design and testing on this new addition to the large spinner category. These Armadillo's weigh in at 2/3oz due to the glass vs metal design. What makes them different is the June Bug Blade. 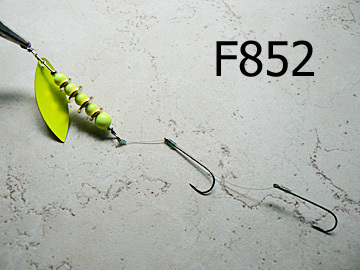 The June Bug blade proved to be a pleasant surprise in the water. It has a uniquely consistent strobe due to it's fixed angle of rotation. The fixed angle also seems to give it great performance at very low speed. These are skirted Armadillo's with split ring attached #1/0 treble hooks. The skirt adds drag and fans out during speed changes. 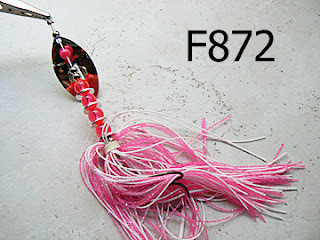 Hooks can be swapped out, or removed to enable skirt replacements due to wear or to switch color variation with a new skirt. Kind of cool. Slide off the old, slide on the new. You can even remove the skirt and fish them without it, go ahead try it! Vive la difference! Here's a few pictures and a link to the web store. 28 variations to choose from. Get one in the water and see for yourself! 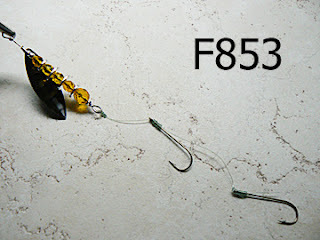 New for 2012 - the 1/4oz Armadillo is after walleyes. Added some willow blades for faster closer to the body rotation and a crawler harness. Four blade color variations with fluorescents or glass bodies. 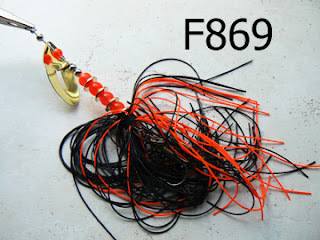 The bait harness is tied to the wires tail loop with a modified cinch knot. 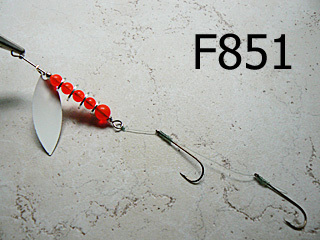 Two #2 Aberdeen hooks strung on 15lb test monofilament line. Here's the first look at them! Here's a link to the web store entry if you want to check them out! 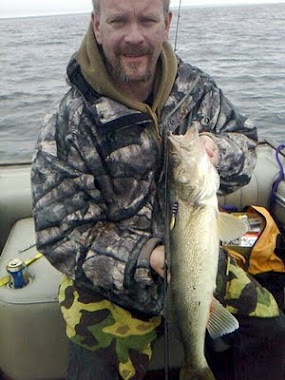 They're in the Walleye Category. 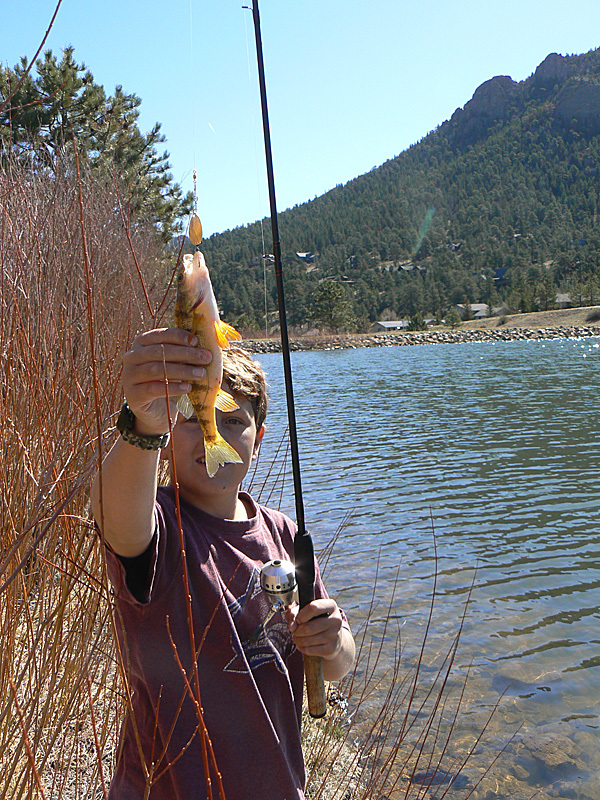 The Grandkids had a day off school Friday, so we spent a couple days in Estes Park this weekend. Once again, both Sable and Eli out fished the old guy. 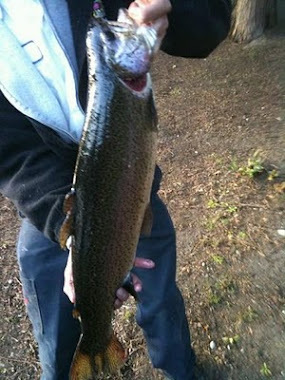 Sable caught nothing but Trout; Brookies and a nice Rainbow about 18 inches. She also caught a small carp and a crayfish. She's loves the water and outdoors. Here's a few of her catches. 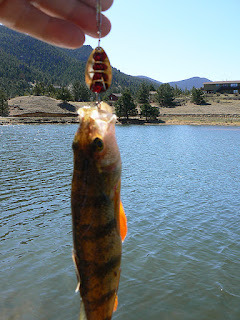 Eli caught frisky pansized Perch, maybe five. 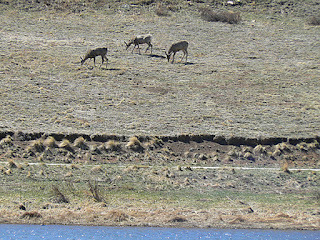 Saw Deer, Elk sign, Osprey, Ducks, Turkey Vultures, and Kingfishers. All over the course of a few hours in the sun. This guy was here last year! 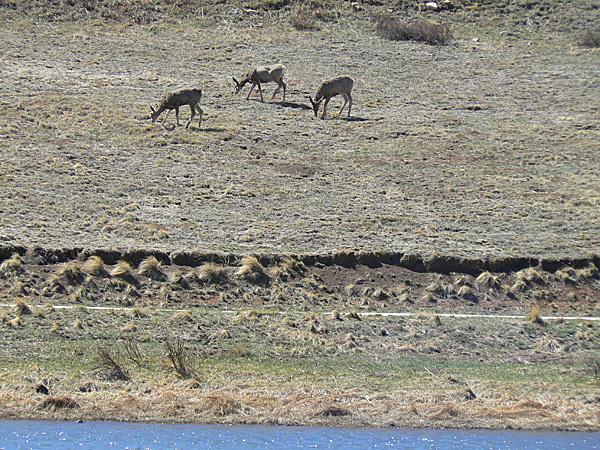 No shortage of deer or elk in Estes Park this year. 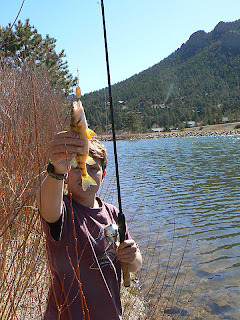 I did hook a big Rainbow with Eli's pole after he unhooked a perch and was taking it to his live well. 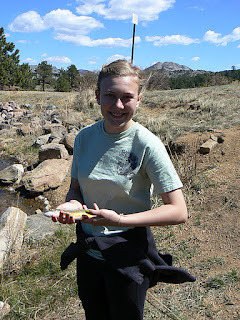 Mine was about 24 inches, a pretty big fish, I was surprised. 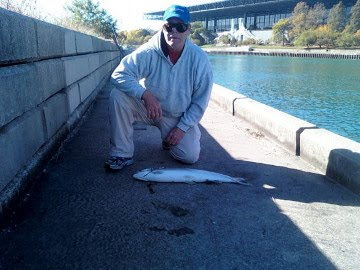 As I got him close to the bank, I paused to adjust the drag on Eli's reel, mistake.. In that split second, the fish took off and snapped the line.. bummer. I'll be back! 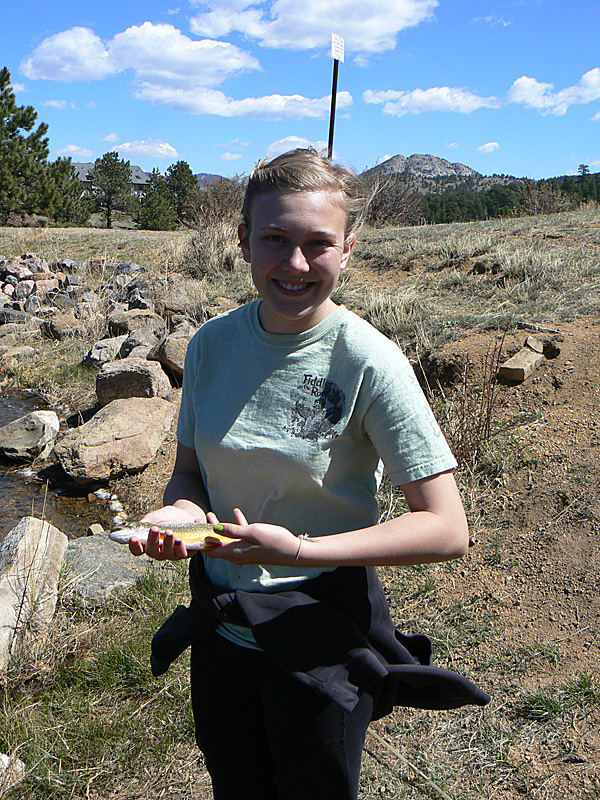 These streams hold beautiful native fish, but are a challenge to find and then fish. Narrow, usually surrounded by overhanging brush, and many times swift. The trout have it made. The brush makes it difficult to approach quietly. It's impossible to cast any distance and hard to find a lure or spinner that works in these conditions. 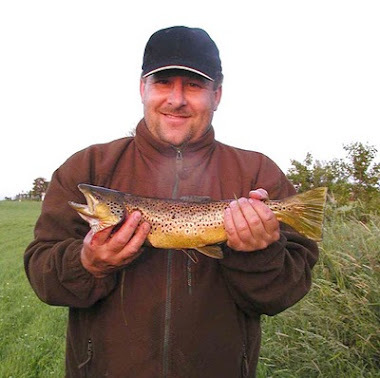 On the up side, who cares, it's always a great fishing adventure in beatiful country! Challenging fishing at that. Wild colorful fish, if you can catch one. 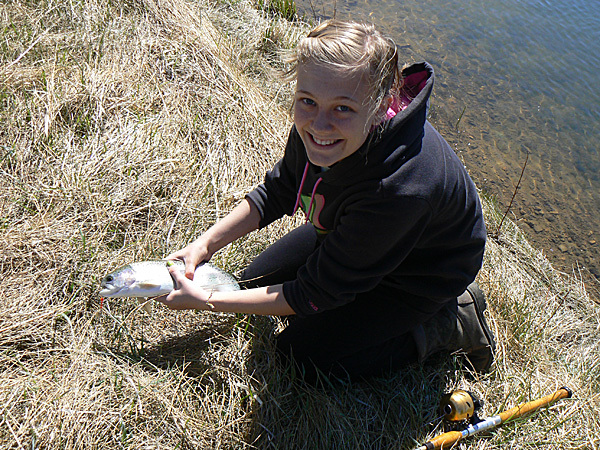 No long casts down a bank and retrieving the spinner past them, it's just not possible. It's sometimes hard to even get the spinner to spin because retrieve space is so limited. No long run to jump start one either. 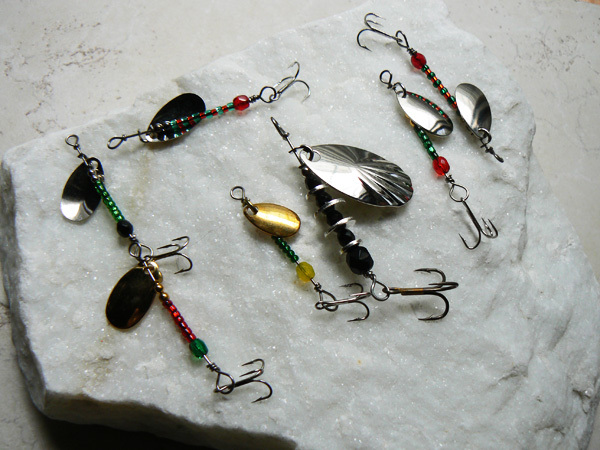 I've made special ultralite spinners for these waters. 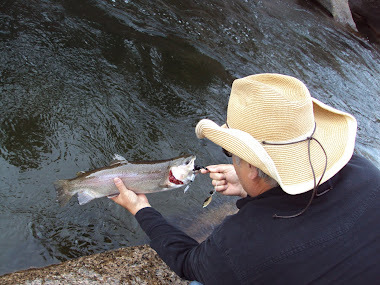 The kind you drop into a riffle and wait for the fish to come over. 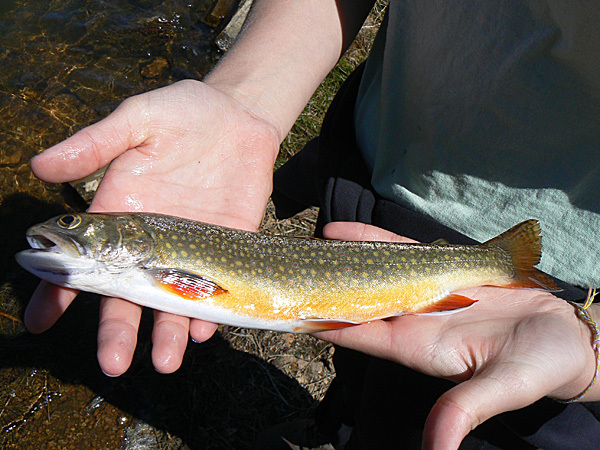 Here's some little guys that specialize in these waters. I put that black 1/8oz Armadillo in the picture for comparison. About 1/24oz depending on length. You can barely cast these, no accuracy in brush anyways. Not a spinner for average use, but not an average place. Pendulum drop them into current, where they can be drifted while spinning down to your prey. You're on your own getting to where you can do that! 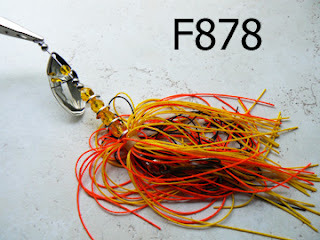 If fishing with spinners is your passion, you spend a lot cycles looking at finished products. I spend a lot of cycles looking at component choices. It's interesting to see how many component options there are to choose from and combine, then imagine how they get selected, assembled, packaged and distributed. Finally marketed on the walls of your favorite tackle shops. Anyways, getting back on track. Through the years, as I've looked through catalogs by Hagens, Worths, and Lakeland, I'm always intrigued by the June Bug blades. It had an exotic quality. Some relic from days gone by? A specialty blade? I suppose you have to be a bit of a nerd to appreciate its engineering. Different from clevis blades and Inlines. One of a Kind, in my opinion. Eloquent in it's simplicity. The June Bug blade. Two points of rotation, it's strung on the wire like an inline blade (no clevis), but has a fixed brace with a second hole punched in it during machining. I'll bend down the brace and string it during assembly, making it's second point of rotation. Weird. How's this baby going to work? But... Eureka! Guess what? Twice the blade noise generated during rotation! Granted, this blades rotation position is fixed. Component contact is minimal. Totally different then say an Armadillo with a clevis blade banging around during rotation, or an inline blade that has a wobble. Intriguingly different. Vive la diff'erence! Still, the brace will rotate and drive other component rotation. That's where I'm headed. Then a more subtle observation. Once the brace is pressed down into its spinning position, a hole in the blades surface is opened. An opening for water to rush through during rotation...hmmm, interesting. Hmm, a fixed angle of rotation, veeerrry interesting! Time to break out the hydrophone? Now to line up some other partner components for this masterpiece. I learned this field cleaning technique out West and thought I'd share it in case someone else wanted to try it. The writeup ended up longer then I expected, and I hope I described how to do it correctly. Old school, catch and keep, learned from a Wyoming hunting guide. I'm right-handed. This is the right handed version. It's a technique for the pan sized fish, not anything over fourteen or so inches. If you're interested, read on. 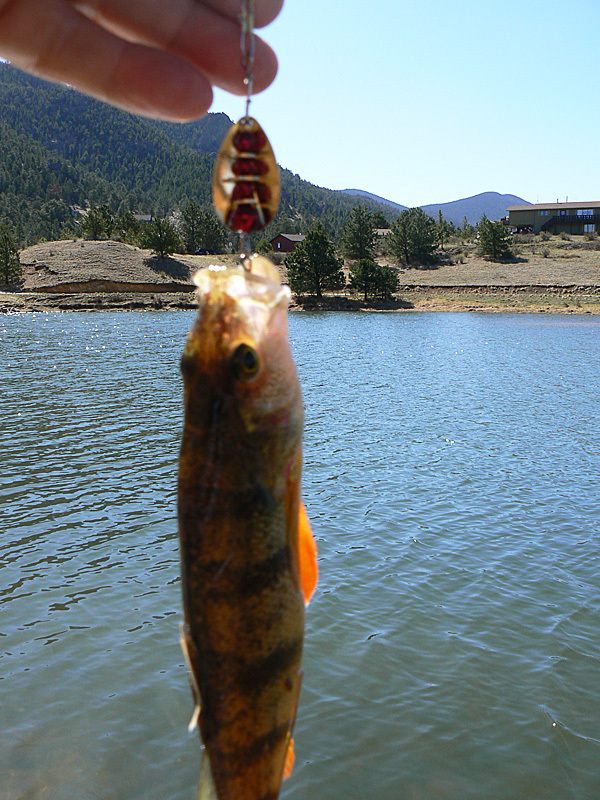 If I decide this one is dinner, the hook comes out and I'll quickly break his neck to end his life. Holding him in my right hand facing left. His belly resting on my fingers and my right thumb on the backbone, as a pivot point. I put my left thumb on the top of his neck and my left index finger inside the mouth. Grasping tightly with my left hand, I bend his neck up and back against my right thumb, to cause it to break. Field dress him to remove waste - gills, front fins, and guts. This method leaves the head on, takes two cuts and a tug. Standing up, no table. Fish never leaves your hands. Holding fish belly up in my left hand, I first make a long cut from the vent just under flesh, up to the narrow area between the gills. With this method, it's important to leave about a Nickle sized area uncut, just at the base of the gills, about between the front fins. 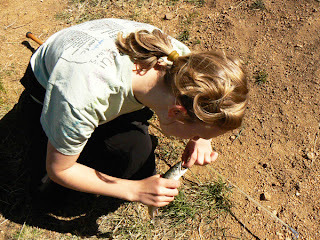 Remembering the fish is still belly up, I re-position my left hand to hold the fishes head, putting my thumb inside the mouth, supporting his head in my left hand, by resting the top of his head on my left index finger as the body hangs, supported by my fingers and thumb. The next and last cut is up through his throat, just in front of the lower gills. That narrow bridge between the base of the gill covers. At this point, I'll stick my knife in a tree or lay it down on a rock, I'm done with it until I rinse it. With the belly still face up and supported by my left hand. My right hand grabs the recently cut lower gills and the uncut belly area to tear it off. Thumb bent inside the throat on the base of gills and pinching against the right index fingers second knuckle outside. A quick tear to toward the tail with your right hand, tears out all the gills, removes the throat, the front fins, and guts as it breaks the uncut portion of skin. You end up with a nicely dressed fish in your left hand and waste in your right. Respectfully dispose of the waste and rinse the fish. 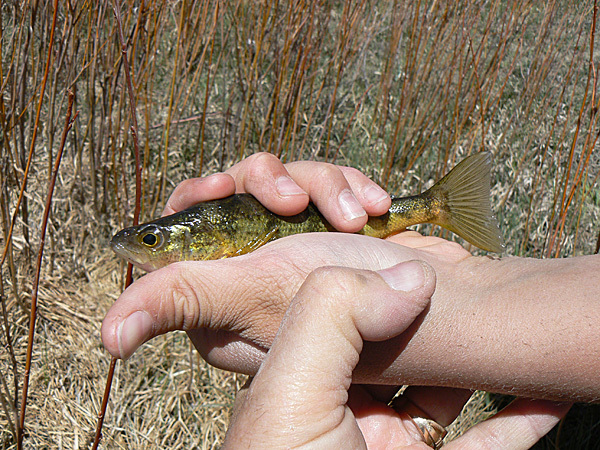 When rinsing the gill area and the body cavity, you'll see a blood line along the backbone. I run my thumb under it to remove the blood. One more rinse, and into your creel, day cooler or back in the water on a rope stringer and back in the water, to stay cool. Oh yeah, Don't forget to find your knife and give it a rinse too. In the words of Hank Williams Jr.
"We're from North Carolina and South Alabam, and little towns all around this Land." Thank-you Hank - Country Boys can Survive - check it out, it's got a message. Here's a few Google maps screen shots from the Fish Creek Spinners 'Get on the Map' page Customer view. They illustrate the Fish Creek Spinners presence around the globe by location or retail business. As we expand, we add more icons. Google Maps segments when it's had enough additions to slow down it's interactive performance. Because of this feature, we currently have 3 maps show progress over our history. I used two custom icons built with an Icon Editor. The green fish represents Online Sales. The Brown display shows Retail locations selling Fish Creek Spinners. White space shows opportunity. Blue space is where the fish are! Even zoomed out, there's plenty of white space left. Pretty good Retail presence in the Central Mountain States though. Here's the other two US views. If you wanted to check to see if anyone else was fishing FCS in your area, you'd need to check each of the maps on the Get on the Map page, using zoom and positioning to find your spot. If you're an online customer and don't see an icon on your location, it's my oversight. Let me know. I'd be happy to make a correction. This little 4 propeller spinner churns up a lot of vibration and awesome noise as the props rotate on the stainless wire shaft. This little 1/10oz spinner is the stream version. If you hold up the rod tip, the propellers will churn the surface. At 3 inches long, its a little longer then many smaller inline spinners. Large propellers are available on request. 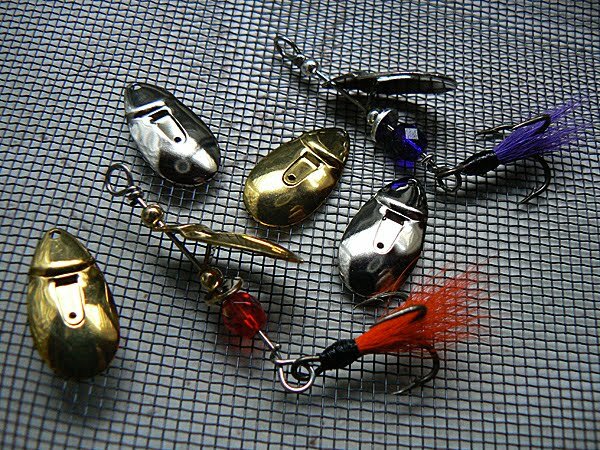 Some anglers remove the hooks from the larger prop versions and put them before a leader in front of other lures for the added turbulence. 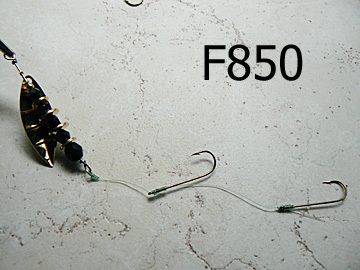 This set had nickel trebles on them in the pictures, but they are now brass trebles with options for single hooks on request.